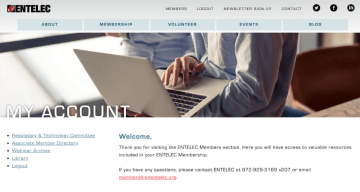 Earlier this year, ENTELEC unveiled our new branding and website designed to improve the experience for each member and person interested in our user association. Now, we are proud to unveil a new “Members Only” section on the ENTELEC Website. Complete your profile to access the Members Only resources. What Else Did ENTELEC Update for Members? In addition to launching the new membership homepage, ENTELEC introduced a new Members Only LinkedIn group. In the past, you may have used the members-only forum on our website to interact with other ENTELEC members and address real challenges in your respective industry. Now, we are advancing our collective capabilities through an enhanced LinkedIn group experience. You can post questions, answer questions, and provide updates on the latest technological developments in your industry. If you have questions about our new Members Only offerings or your ENTELEC membership, please contact our team at info@entelec.org.